Sushasoner Jonno Nagorik (SUJAN) has called upon the Election Commission (EC) to take initiatives for holding the 11th parliamentary election in a free, fair and transparent manner. Syed Abul Maksud, executive member of Sujan, expressed doubt that if the EC works neutrally, it might incur displeasure of the government. "So, I think the EC could not work neutrality as it will create displeasure of the government," Abul Maksud said. "Some of the ruling party high-ups praise activities of the Election Commission in such a way as if they are the commission's public relation officers," he commented. "Why should they do so?" he questioned the EC. He called upon the EC to work neutrally for ensuring the people's voting rights in the national election slated for December 30. "So, to earn people's confidence, the EC should prove that they are really capable of working neutrally," he said. Abul Maksud came up with the observations at a programme titled "Electoral Manifesto: Citizens' Expectation" organised by Sujan at the National Press Club in the city on Thursday. 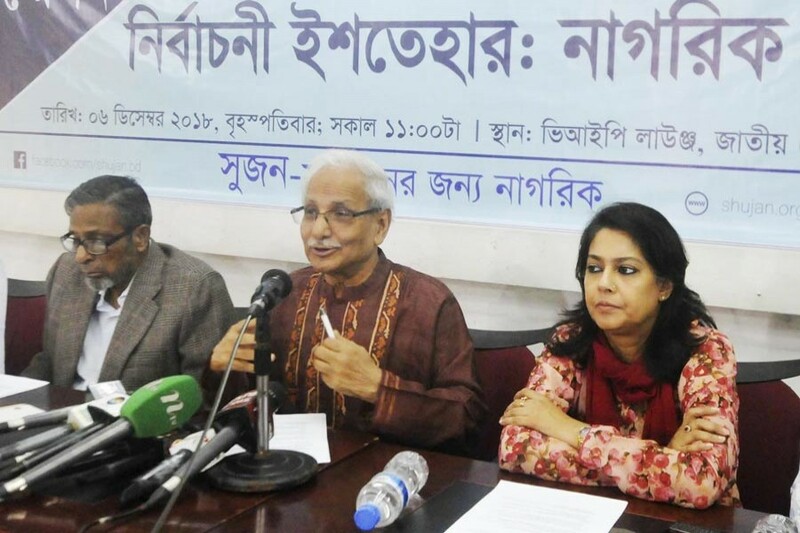 Dr Badiul Alam Majumder, general secretary of Sujan, read out a statement containing a manifesto and urged the contesting political parties to merge it with their respective manifestos for the parliamentary polls. M Hafizuddin Khan, president of Sujan, said a neutral and fair election can be held if the EC enforces the electoral and other rules properly. Sujan, in their manifesto, called upon the political parties to do politics imbued with the spirit of Liberation War, ensure people's right in running the country, establish the rules of law and implement the electoral pledges properly after assuming the state power. It also urged the government to create scope for more investment in the education and industrial sectors for creating more employment, stop corruption in banking sector, ensure women empowerment and stop politics of violence and establish good governance. The civil society platform's manifesto also called for stopping enforced disappearance and extra-judicial killing, ensuring freedom of press, reforming the Digital Security Act, ending trial of the war criminals, strengthening local government bodies and eliminating militancy. Executive member of Sujan Syeda Rezwana Hassan and its central coordinator Dilip Kumar Sarkar among others were present.